Assist the Priest during the Mass. Assist the Priest in the distribution of the Precious Body and Blood of Christ. Click here for more information. Maintains the environment of the Church through keeping the flowers fresh and changing banners/decorations with the liturgical seasons. Proclaims the Word at liturgies. Click here for more information. Works to enhance the public prayer life of the parish. Assists in planning liturgies for special occasions. Plan, prepare and provide worship music at parish liturgies. Assist the Priest by assuring all resources and ministers are ready prior to Mass..
Monitor and adjust the sound board and computer during liturgies. Greet and assist people before Mass, help with the Collection, direct for Communion, and distribute bulletins at Mass end. Meets during the 9:30am Mass Sundays, except the first one of the month, October –April. Year 1 classes in preparation for 1st Communion. For students with no prior Faith Formation. Meets Tuesday 5:30-6:45pm. For students not preparing for the Sacraments. Meets Wednesday evenings 6-7:15pm. New this year! 6th graders will have their own youth group. Meets Sunday 10:40am-11:50am, between the Sunday Masses. English class Wednesday 6-7:15pm; Spanish Tuesdays 7-8:30 pm. Sunday evenings 6-8pm. There are also a one 3-day retreat and one 1-day retreat (both required). The 1st Sunday at 9:30am in November, December,. February, March and May. The 2nd and 4th Sunday during the 9:30am Mass. The last week in June, Monday-Friday, 9am-12 noon for preschool-Grade 5, with MS, HS and adult volunteers. Fellowship ministry that includes monthly potlucks, fun field trips and outreach events such as Christmas at Larch Corrections Center. Monthly meetings 2nd Saturday 6:30-9pm. Offer loving comfort, support and encouragement to those who have lost a loved one through death. May include delivering food, attending funerals, phone calls or mail, and ongoing prayer. An opportunity for women of all ages and stages of life to develop fellowship. Meets September through June on the 1st and 3rd Monday at 6:30pm. (Please note, first September meeting is tentatively September 18th.) Click here to email the parish office and confirm meeting day and time. Helps address issues and concerns and assures the ongoing upkeep of the parish cemetery. Volunteer teams clean the church weekly to keep it safe and inviting. Click here for the most current schedule. Advises the Pastor regarding stewardship of parish fiscal resources. Meet six times annually, Monday evenings 5:30pm. Supports bereaved families by offering a reception as a place of fellowship following a funeral Mass. Keeps the parish grounds beautiful and peaceful by ongoing care and maintenance. Consultative body to the Pastor in developing and living out the mission of the parish. Knit or crochet shawls for the seriously ill while praying specifically for the individual. Provide pro-life education and support through resources and activities, including Natural Family Planning classes. Make quilts to give away while enjoying fellowship. Gather January-October, Tuesdays 1pm. Plans are formulating for a cooperative effort with the four other Vancouver Catholic Parishes to provide formation and fellowship opportunities for young adults. Click here to email Nick Longo and learn the latest information. Troop 430 has been active in the parish since 1980 and has provided countless service hours to St. John as well as producing over 20 Eagle Scouts. Meets at the parish Monday at 7pm. Court 2105 began at St. John in July, 1974. Participates in the religious, charitable and educational Apostolate of the Catholic Church. Meet every month on the 2nd Thursday at 7pm. 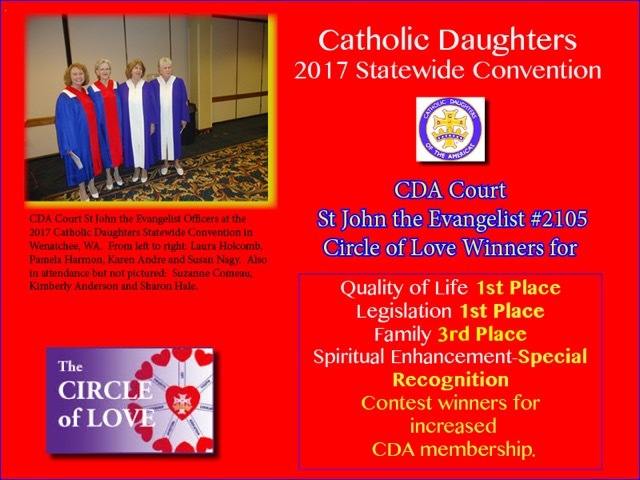 Click here for information regarding the CDA Convention. Council 12983 meets every month on the 1st Thursday at 7pm. The Knights are a fraternal service organization promoting social and intellectual fellowship among its members. The Legion of Mary is an international organization that witnesses to the truths of the Catholic faith through various apostolic ministries. Meets Fridays at 10am in Room I. Various opportunities to help before and throughout married life, including marriage preparation, Engaged and Marriage Encounter Weekends, and annulments. A Catholic lay organization inspired by Gospel values offering person-to-person service to those in need.